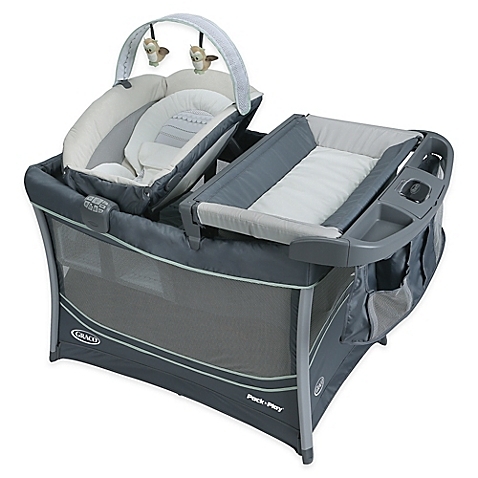 If you prefer a playard with all the bells and whistles, check out Graco’s Pack ’n Play Playard Everest. In addition to the playard and removable infant bassinet, it also comes with a portable lounger with two speeds of vibration and a toy bar. It also includes a changing table and ample space to organize diapers and wipes. The lounger and changer can be used with babies up to 30 pounds. The playard comes in two patterns: a black, gray, and red design and another with gray tones and light teal blue. It sells for $319.99 from Graco’s website, GracoBaby.com.